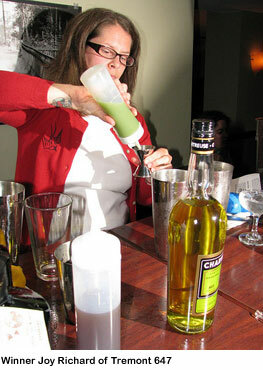 Joy Richard, bartender-manager at Tremont 647 and Sister Sorel in the South End, also known as Bourbon Belle of LUPEC Boston, won the Hendricks Gin Beantown Bartender Battle at Green Street on Tuesday night with her recipe, Nobody’s Darling, and the limerick she wrote to describe it. Congrats to Joy; she gets to fly anywhere in the country on Hendricks’ dime. Her drink, which will soon be on Tremont 647’s cocktail menu, was a most unique mixture starring the flavor of celery (one of the dozen botanicals used in Hendricks). Parked at the bar for most of the evening, I was like the misbehaved kid in the back of the classroom ignoring the lesson, so I don’t have much color commentary for you (check out C. Fernsebner’s captioned photo gallery on Bostonist for an idea of how the battle went), but I did manage to track down all five finalists’ recipes — which only the judges got to sample that evening — along with Joy’s winning limerick. Yellow Chartreuse, lemon juice and there goes! Shake first three ingredients in an iced cocktail shaker, pour into a highball glass, top with mint sprig. Shake all ingredients in an iced shaker, pour into a highball glass and garnish with a candied orange peel (the candied peel is a by-product of the simple syrup — just roll the peels in sugar and let them dry out). by Jeff Grdinich of White Mountain Cider Co.
* Infuse 1 bag per 8 oz water for 5 minutes. ** Dilute 400g Demerara sugar in 1000 ml water. 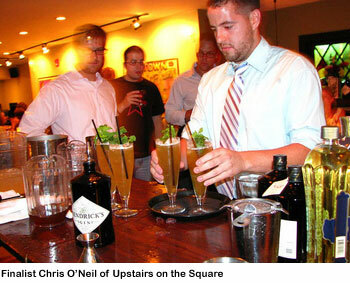 *** Amount of lemon juice and Fernet varies based on tea infusion. Start small. Place all ingredients in an iced cocktail shaker, shake well and strain into a chilled cocktail glass. Note: In the spirit of the competition, which required highlighting the botanicals used in Hendricks, Jeff put one hell of a garnish on his cocktail: a toasted brioche and cucumber sandwich brushed with butter that had been infused with most of the Hendricks botanicals. If you simply must have the recipe for that, email me. Shake all ingredients in an iced cocktail shaker and pour into a highball glass. Top with ginger beer and garnish with lemon wedge and cucumber spear. Shake with ice and strain into cocktail glass.